How much is my brand worth in financial terms? How much will my marketing grow its value? Despite their seeming simplicity, these two questions have frustrated brand practitioners for decades. It is well accepted that there is a link between brand building activities and corporate profits. After all, the entire field of marketing is based upon this proposition. Yet it is equally well accepted that there is no standardized approach that companies can rely on to quantify brand value in the dollar-and-cents terms applied to other assets. This puts marketing at a severe disadvantage within boardroom discussions of resource allocations, as its expenditures are all too often seen as pure costs rather than investments in the business. And this is despite a growing realization that intangibles account for up to eighty percent of overall corporate value with brands being at the top of the list. But one industry group is actively working to change this. The Marketing Accountability Standards Board (MASB) created the Brand Investment and Valuation (BIV) project to establish the quantitative linkages between marketing and financial metrics. The solution they have proposed is as simple as the questions themselves: Identify a “brand strength” metric which captures the impact of all branding activities, understand how this metric translates into financial returns (ultimately cash flow), and then use this to calculate a brand value and to project the return from future marketing investments. One of the indicators of the strength of a brand in the hearts and minds of customers, brand preference represents which brands are preferred under assumptions of equality in price and availability. Relevant: It has been proven to capture the impact of all types of marketing and PR activities. Over the last 45 years it has been used to measure the effectiveness of all forms of media (e.g. television, print, radio, out-of-home, digital), events (e.g. celebrity and event sponsorships), and brand news (e.g. 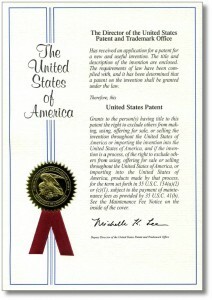 product recalls, green initiatives). It has also been shown to capture both conscious and unconscious customer motivations and so applies equally to rational, emotional, and mixed branding strategies. Predictive: Its ability to accurately forecast financial outcomes has been demonstrated in a number of studies. This includes studies comparing preference to sales results calculated from store audits, in-store scanners, pharmaceutical prescription fulfillments and new car registrations. When applied to advertising, changes in brand preference have been proven to predict changes in the above sales sources from control market tests, split media tests, pre-to-post share analysis and market mix modeling. In fact, Quirk’s Magazine noted over a decade ago that “this measurement has been validated to actual business results more than any other advertising measurement in the business”. Objective: It is purely an empirical measure by nature. No subjective interpretation is needed. Calibrated: It has been applied to the broad spectrum of brands and categories and its correlation to sales has proven consistent across geographies. Furthermore, it self-adjusts to the marketplace where it is collected so it has the same interpretation without any need for historic benchmarks. Reliable: It has been shown to be as reliable as the laws of random sampling allow. This is true both for brand preference gathered at a point in time and for changes over time caused by marketing activities. The table below summarizes this consistency in measuring changes. Changes in brand preference caused by 49 campaigns were each measured twice among independent groups of costumers. 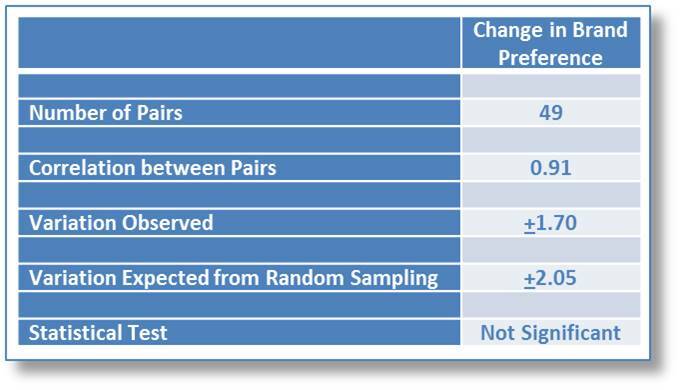 Observed variation between the pairs was compared to what would be expected from random sampling. 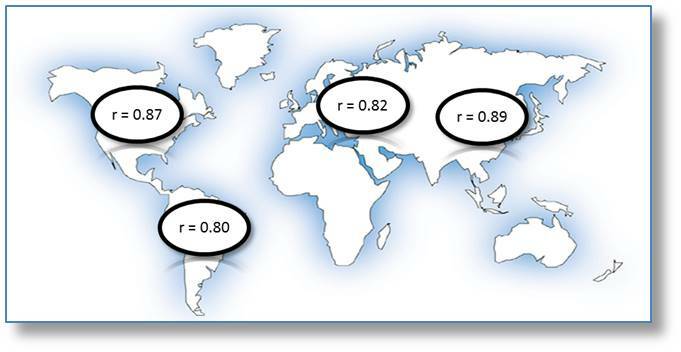 The ‘not significant’ conclusion confirms that the measure is as reliable as the laws of random sampling allow. Sensitive: It is able to detect the impact of media even from one brand building exposure (e.g., a single television ad shown once). Simple: It is easily applied and understood. It can be incorporated within any type of customer research including tracking, pre-testing, post-testing, segmentation, strategy, product concept. Causal: While it captures the effect of product experience, it is not driven by just product experience. In fact, it has been proven predictive of trial for new products for which consumers have no experience. Transparent: It doesn’t rely on ‘block box’ models or norms. Quality Assured: Its reliability and predictability are subject to continuous review. To verify its suitability as the brand strength metric, MASB included an aggressive trial of brand preference as part of its BIV project. A cornerstone of this endeavor was a longitudinal tracking study sponsored by six blue chip corporations and conducted by MSW•ARS Research. 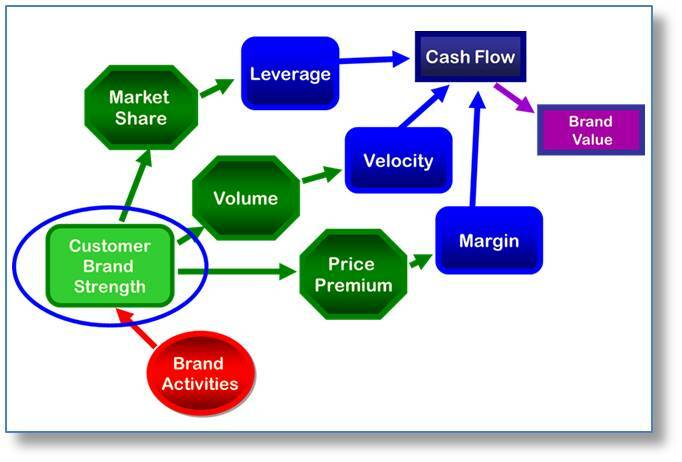 The two year study covers one hundred twenty brands across twelve categories with a variety of market conditions. In part II of this article we will review several of the key findings from this project, which are already changing industry perceptions on measuring brand value and making brand building investments. The MSW•ARS Brand Preference measure can be incorporated into a wide variety of research and can even become a standard key performance indicator in your reporting, particularly in your tracking data. In future blog posts we will discuss this and how you can easily apply it. If you don’t want to wait then please contact your MSW•ARS representative to learn more about our brand preference approach. In the 2010s there may be no better mantra for the marketing function than the old adage “work smarter, not harder”. Faced with stagnant (or declining!) budgets and staff levels, it is no longer practical to use brute force ad spending to drive marketing returns. Instead marketers are seeking ways to apply new technology to existing data so as to squeeze out every drop of value. 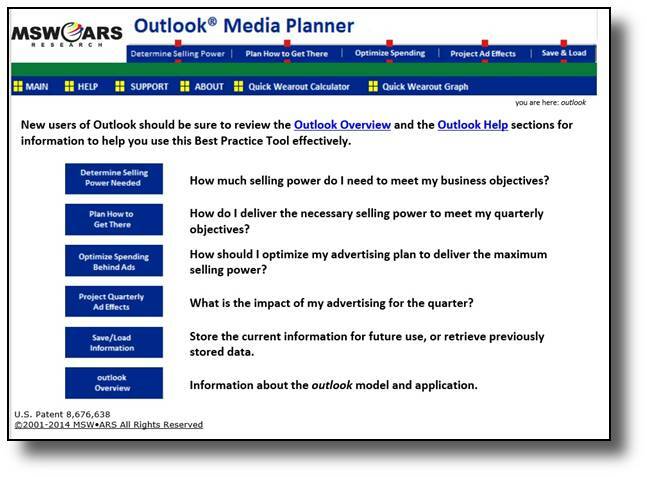 Towards this end, we are providing all TouchPoint Plus copytest users free consulting with the newly patented Outlook® Media Planning and Forecasting tool. Below are three examples of how this is being used to help television advertisers immediately ramp up returns with no additional outlay of time or money. Customized ad refreshment schedules. It is now well established that the selling power of an ad diminishes as media is placed behind it. To avoid wasting too much spend behind worn out ads, rules-of-thumb have been created (e.g. not airing an ad for over 1200 GRPs). Such broad rules are ‘generally right, but specifically wrong’ in that they neglect the fact that each ad wears out at a different absolute rate depending on its strength. 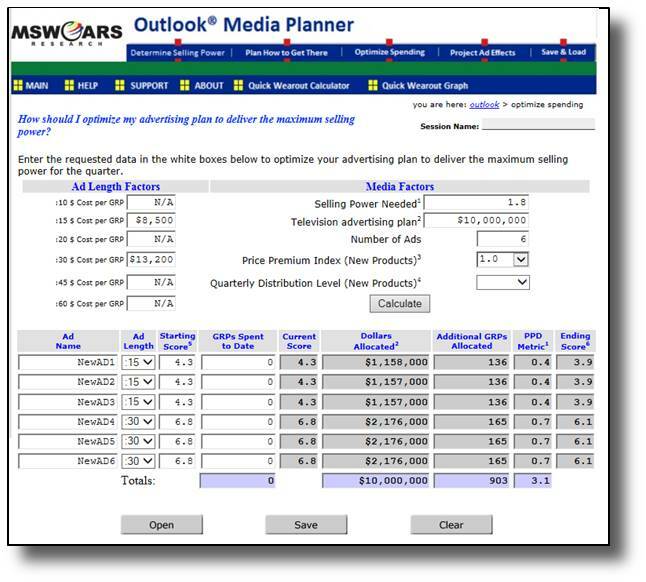 The Outlook application uses this knowledge to algorithmically find the optimal allocation across available ads, sometimes yielding millions in additional sales. Mix of different length ads. Facing pressure to reduce paid media while expanding effective reach, many advertisers are rediscovering the cost effectiveness of shorter length ads. At 60% to 70% of the media cost of their 30-second counterpart, 15-second ads are particularly attractive for stretching a media budget. But since shorter length ads generally underperform their longer counterparts there is a risk that overuse will actually suppress returns not expand them. Generalizations fail to address the problem as they don’t take into account the size of the campaign, the number of ads available, or brand specific effectiveness ratios. A module within the Outlook application simplifies this decision and, even at the very early planning stage, provides a specific recommendation taking all these variables into account. 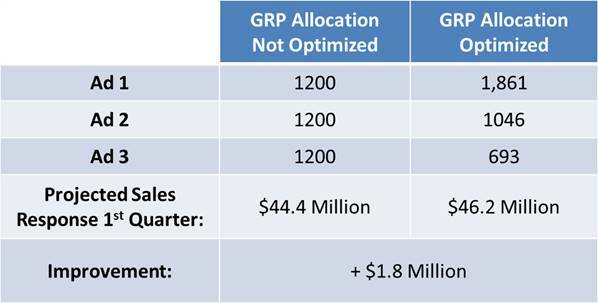 As an example, this below scenario finds that a 45%/55% 15 vs. 30-second GRP mix is optimal (this equates to an approximate $3.5 Million / $6.5 Million split for this brand’s planned $10 Million campaign). The end result for StarKist was a 368% return on their investment. This was versus a 76% return without the increase in spend and an expected break-even had the traditional approach been done. The above highlights just three of the many ways that Outlook planner can help boost marketing returns. But hopefully they illustrate that the technology exists to help meet today’s ‘less must be more’ reality. 1A true return on investment… Developing and managing advertising for StarKist Tuna in a Pouch, Barry Shepard. Quirk’s March 2003. Bold emphasis added.